Do you ever watch old movies where the beautiful hollywood actresses put on their makeup in the most beautiful looking packaging and feel a little jealous? It definitely doesn't quite compare to the cheap, plastic packaging we're used to. 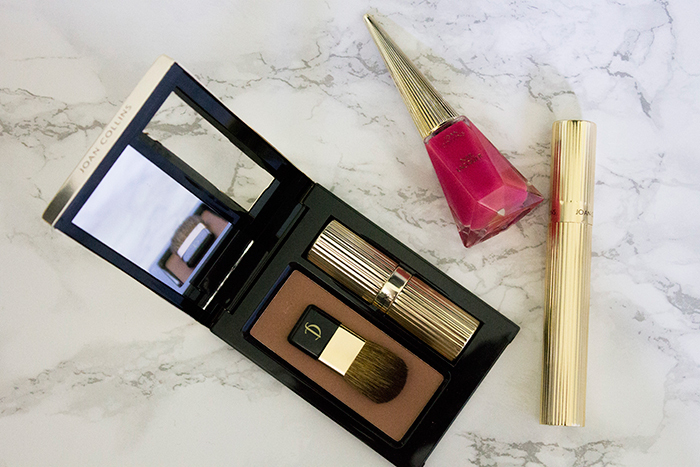 Now you can get a little taste of glamour with the gorgeous range of makeup from the Joan Collins Timeless Beauty collection. First off, who better to introduce a collection of this nature than Joan Collins? You can see from the packaging alone how the range has been influenced by old hollywood and art deco but this also translates into the products too. The collection features everything from fragrance to skincare but today is all about the makeup. I was surprised by how much choice there is in the range but one thing I really loved is that there are certain products which share the same name so you can get the exact match if you like to coordinate your nail polish with your lipstick. Now that we've covered the background, here's a little bit about the products I had the chance to try. First off we have the Class Act - Black Mascara which comes in this gorgeous gold packaging. It's definitely something I could imagine the hollywood ladies owning back then. The mascara itself is a fibre brush and once applied to the lashes, you get a real doe eyed look. 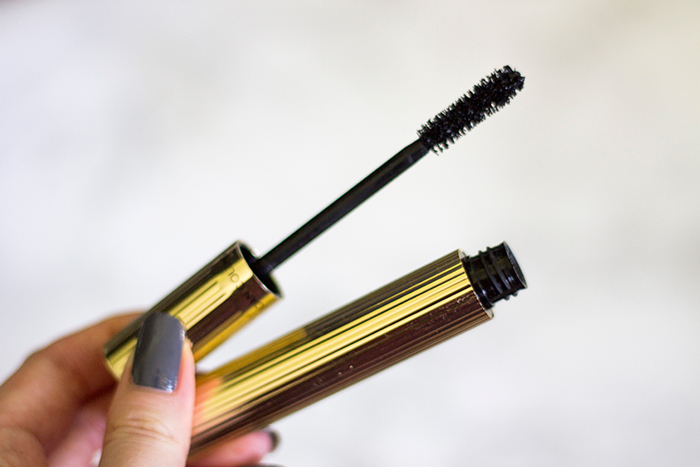 It's a great mascara for lengthening and it appears very black on the lashes but with a few coats I do think you can achieve more volume. I wouldn't say it's groundbreaking but it's really good quality and it feels like you're wearing nothing on your lashes. The product that really caught my eye was the Summer Kiss Duo in Evelyn. This is a gorgeous compact featuring a lovely browny toned blush and lipstick in the shade Evelyn. 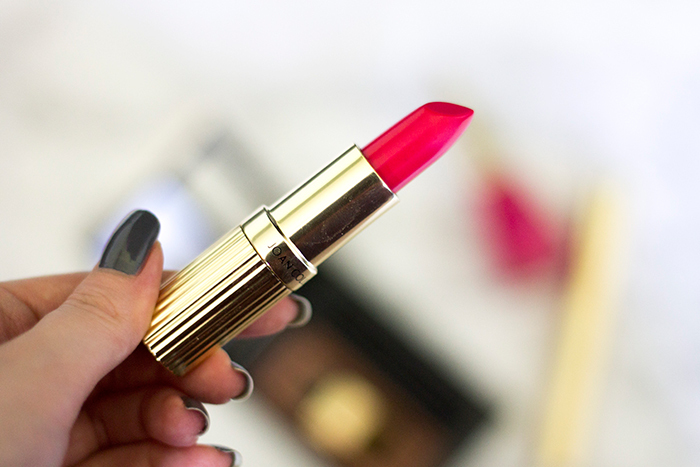 While the blush is quite neutral and soft, the lipstick is anything but. 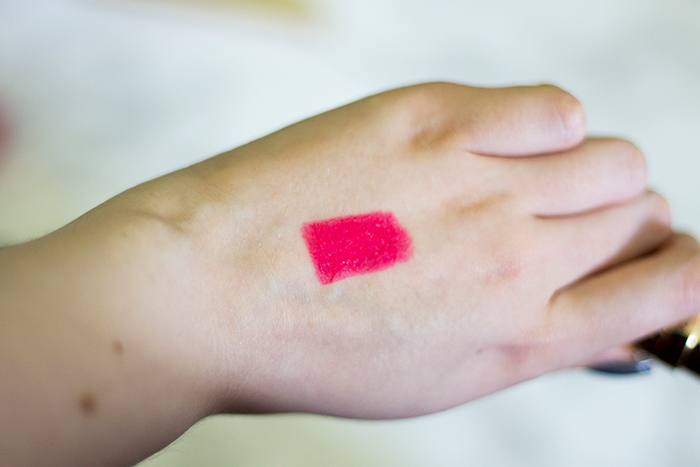 As you can see in the swatch above, it's a super bold and bright pink shade which is perfect for the Summertime. I do think this kind of shade is better suited to slightly more tanned skin but on days I'm feeling brave I'll definitely give this a go. Last but not least, I couldn't go without trying a nail polish so I went for the Nail Lacquer in Evelyn, just like the lipstick. It's a bright, coral shade with a glossy finish in a gorgeous triangular bottle. I do love the colour and it applies fairly well but it does go on quite thick so it's not my favourite kind of polish. I will be featuring the shade in next week's nail post so make sure you come back for that if you'd like to see swatches and more info on how it performs. Overall, I'm really impressed by the range. I think it would be lovely to receive as a gift, especially for those who love the old hollywood era or maybe someone a little older. If I had to choose one product, I'd definitely go for the lipsticks. I was blown away by the pigmentation and if you really want to make a statement, definitely pick up the shade Evelyn.